SCVHistory.com | People | Hart Park Boss Norm Phillips Promoted to Castaic Lake, 10-4-2016. Hart Park Boss Norm Phillips Promoted to Castaic Lake. SCVNews.com | October 4, 2016. Phillips at the Hart of the West Powwow on Sunday, Oct. 2, 2016. Photo: Leon Worden. Click to enlarge. 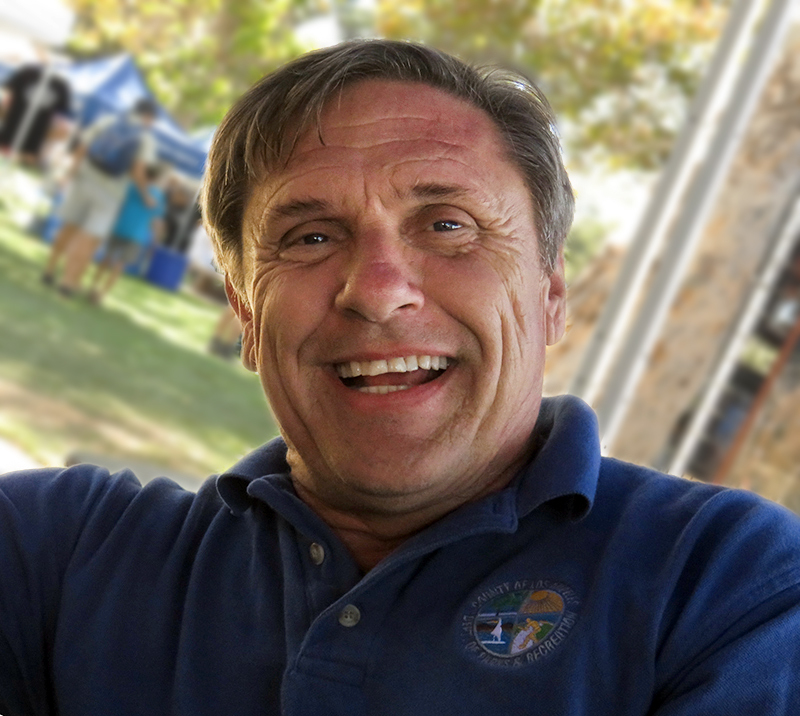 Norman Phillips, longtime superintendent of L.A. County's William S. Hart Regional Park in Newhall, has been promoted to Regional Superintendent III and will oversee the county's Castaic Lake Recreation Area. "Norm brings extensive experience to this new job," Deputy Parks Director Hayden W. Sohm said in an e-mail message. "He has exhibited a knack for working effectively with all stakeholders within the community, including the Friends of Hart Park, the City of Santa Clarita and the various deputies and representatives from the 5th Supervisorial District." Phillips was one of three founders of the annual Hart of the West Powwow in 1994. He is credited with helping establish the annual Pet Fair (now known as Bow-Wows and Meows, returning this Sunday), and other family-oriented activities that take place at the park throughout the year. He is also the county's liaison to the SCV Historical Society board. 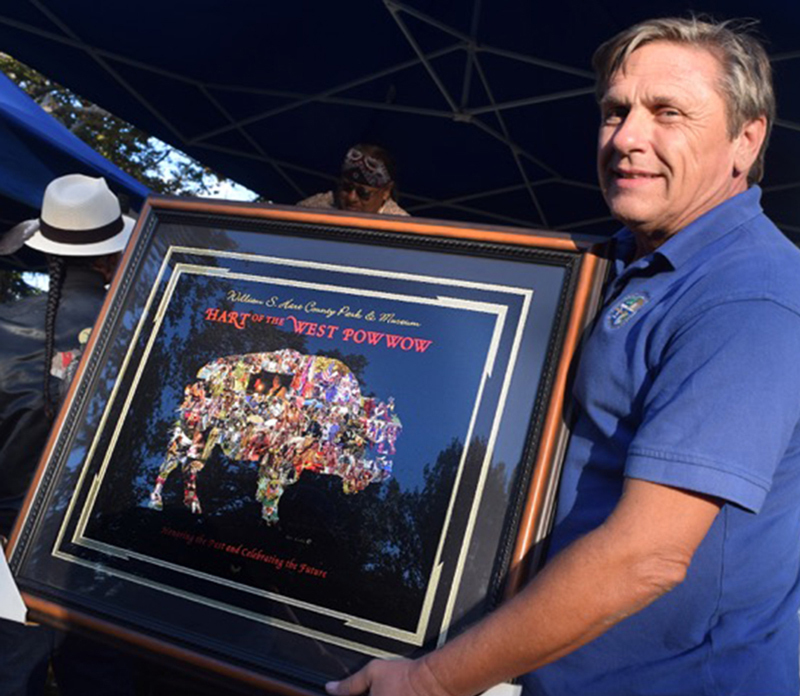 Photographer Ken Lubas presented Phillips with this print on Sunday, Oct. 2, 2016, in recognition of his dedication to the Hart of the West Powwow through the years. Phillips was one of three founders of the powwow; the others were Marylina Schultz and the late Bill Kimmel, aka Standing Bear. Click to enlarge. "Through Norm's leadership, Hart Park provided the public with a variety of quality events and programming," Sohm said. "The park represents the very best that our department has to offer. ... We look forward to working with Norm and the rest of the Castaic team to make Castaic a park we can all be proud of." Phillips was named the successor to Lori Bennett, who recently retired from her position at Castaic, following an interview process that considered "some of the most accomplished employees" in the Parks and Recreation Department, Sohm said. Phillips' current position as superintendent of Hart Park — which also oversees the county's Tesoro Adobe Park in Tesoro Del Valle — will be filled at a later date. It is expected that Phillips will manage all three county park facilities in the meantime.